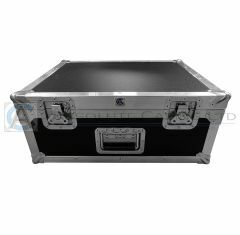 Here at Absolute Casing, we provide a wide range of 2U Rack Cases to satisfy the most diverse needs. Below you will find the 2U Rack which is designed to suit our customers specific requirements by providing a practical, simple solution for the storage and safe transportation of their valuables. The 2U rack case can be purchased in a selection of colours such as black, blue, red or grey with other colours available on request and for an extra cost. Along with this, our 2U server case incorporates an aluminium frame for the purpose of providing extra protection and support to the contents of the case, while the corner braces allow for stacking if you buy multiple cases. When it comes to choosing 2U rack cases, our flight cases are designed to suit the requirements of businesses and individuals alike by providing ultimate levels of protection, so be sure to choose something suitable from us today. The design of the 2U flight case allows users not only to transport their valuables from one place to another, but also to benefit from a perfect, sleek style which can easily be carried thanks to the ergonomic handles it comes with. You can count on our 2U Rack Cases and 2U Server Cases to provide you with a long-lasting case solution. If you need to know more about our range below, then do not hesitate to get in touch with our experienced team. Contact us by calling 01635 579 518 or by emailing sales@absolutecasing.co.uk today.